Atlanta Institute of Music and Media’s new Voice Program combines performance and music technology education for vocalist to expand their skills beyond the microphone and opens new employment opportunities. “The goal of our Music and Technology degree has always been the employability of our graduates, by adding a concentration in voice, we are opening that employment door for all aspiring singers." Atlanta Institute of Music and Media (AIMM) launches its Music and Technology Degree program with a concentration in Voice to help singers develop their talents and acquire essential knowledge needed to earn a living in the music industry. 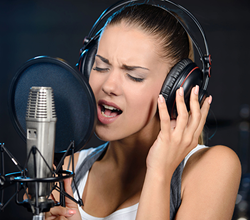 Voice students are immersed in live and studio performance training in multiple genres of music, including pop, rock, jazz and blues. Along with performance, students study music production utilizing Avid’s Pro Tools, Abelton Live and a multitude of analog and digital technologies. The first class commences in October with an Open House for prospective students on August 13th at 12 p.m. Faculty and staff will be on site to provide information about the new Music and Technology voice concentration as well as all programs the institution offers. Established in 1985, AIMM provides non-beginning performance and beginner recording arts students an innovative education focused on developing their musical and production talents to compete in today’s music industry. For over 30 years, AIMM has produced graduates who can be seen on stage, found in studios and heard on recordings around the globe. AIMM offers fully accredited degree and certificate programs in performance and production. For more information, visit http://www.aimm.edu.